At first, I played with software LCD smartie, which is available for windows and linux. I could control display itself, but one possible way how show data outside computer(from internet) is RSS feed. Unfortunately, I did not find any dxc source in RSS feed in very brief format. So, I was thinking what platform use to code interface from telnet DX data to VFD. Between Delphi and ActivePerl, I choose second one. For basic operation is script very simple. Display is connected to our echolink computer. Father and I love to see current DXes on it from every corner in hamshack and have idea about actual CONDX. 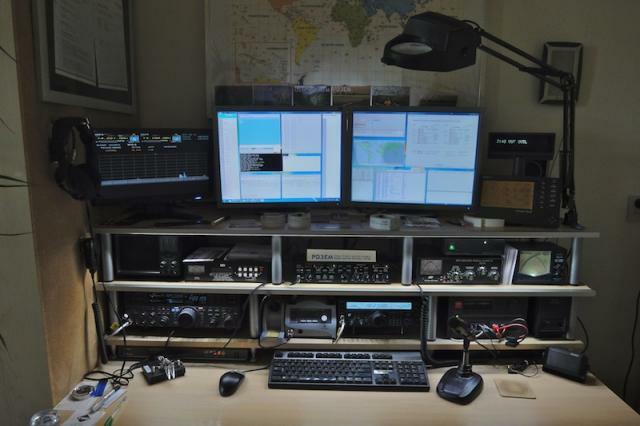 Hamshack of my friend Elmar PD3EM. You can see DX Cluster VFD on right side.